Amazon.com description: Product Description: How did a near-extinct species, eking out a meager existence with stone axes, become the dominant power on earth, able to harness a knowledge of nature ranging from tiny atoms to the vast structures of the universe?Â Leonard Mlodinow takes us on an enthralling tour of the history of human progress, from our time on the African savannah through the invention of written language, all the way to modern quantum physics. Along the way, he explores the colorful personalities of the great philosophers, scientists, and thinkers, and traces the cultural conditionsâand the elements of chanceâthat influenced scientific discovery. 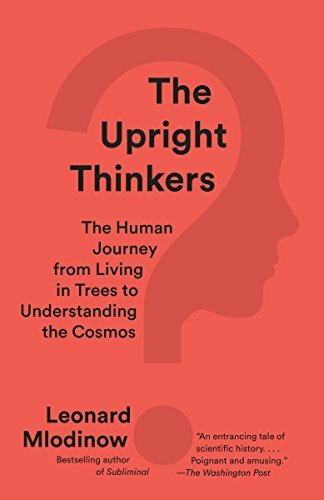 Deeply informed, accessible, and infused with the authorâs trademark humor and insight, The Upright Thinkers is a stunning tribute to humanityâs intellectual curiosity and an important book for any reader with an interest in the scientific issues of our day.